When I wrote it, I had no idea I was about to start reading a series of books that now mean a great deal to me. I can't explain it exactly. I think you need to read the books and go on the journey to understand just how wrapped up in them you can get. 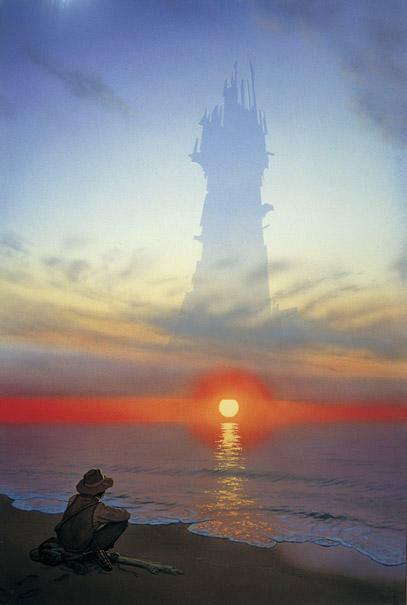 I've proselytized for them before, but I'll do it again now: go read the Dark Tower books by Stephen King. If you don't weep repeatedly in the final book, I may have to declare you have a heart of stone. Oh hell, trust me - you'll weep buckets in the final book. 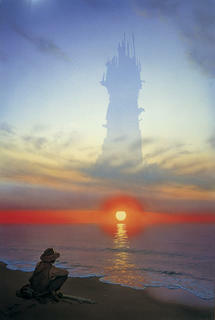 Dod-a-chock, dud-a-chum, look out Dark Tower, here I come! Anyway - in watching my StatCounter over the past few days, I've seen a lot of people come visit my blog via that book meme entry, so I felt it was necessary to revise that piece to reflect my recent change in book-lovin' priorities. Jetzt alles klar. Did I mention that, the other day, I forgot to zip up my laptop bag and, tossing it into my car, I accidentally hurled my beloved laptop to the ground? I nearly blacked out from fear. Had I killed it, I would not have been able to replace it. The coffers are completely bare, folks. Fortunately, I just scarred the crap out of the once-pristine silver top. The screen did not crack, thank you, Jeeezus. The little guy now looks "much loved" and less like something someone would want to steal. Small blessings, huh? I'm really, really careful with the zippers now.